The chart of accounts is the list of all the general ledger accounts that can be used by one or more company codes. 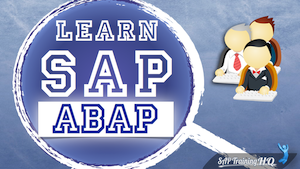 As a good SAP business practice, the chart of accounts should be one of the first organizational elements which a company implementing SAP should finalize. This is because the chart of accounts decides which G/L accounts will be available for general as well as tax related postings. The chart of accounts is defined at the client level i.e. above the company code level. This allows the same chart of accounts to be used by multiple company codes. This is helpful in case of sister companies which are defined as separate legal entities but require more or less identical general ledger accounts. The FBL3N report is used to list line items for multiple accounts across multiple company codes. This functionality is provided by the selection screen of the report. It is also possible to display items from more than one General Ledger account in a customized layout. This report allows changes to individual documents or to carry out mass changes to posted line items displayed in the report. Search help is available to enable a detailed selection of General Ledger accounts which allows access to various possible entries. The search help screen is shown in figure 1 below. GENERAL DATA: The general data consists of the vendor address, country, contact person, bank account, etc. COMPANY CODE DATA: The company code data contains the data specific to a company code like the payment terms, payment methods, dunning procedures, tax details, etc. PURCHASING ORGANIZATION DATA: The purchasing organization data contains information like the sales purchasing organization, partner functions, pricing, etc. The vendor master is extremely important for the materials management, logistics as well as the Financial Accounting module. The details of the vendor such as the payment terms, address, purchasing organization, purchasing group, payment methods, etc. are picked up from the vendor master and provided to the other modules as and when necessary. The total data for a vendor master is stored in multiple tables. The General data pertaining to a vendor is stored in the LFA1 table while the company code data is stored in the LFB1 table. The purchasing organization data for a vendor is stored in the LFM1 table. All these tables are accessed for information about the vendor by the FI and the MM module. 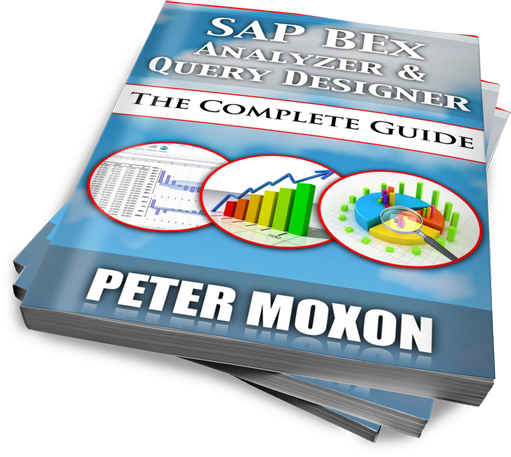 They reduce the time and effort required to get a job done in SAP. They reduce the chances of error while entering data in the selection screens. They reduce the dependency on a particular user by automating the jobs. Most businesses need to carry out repetitive activities on a daily, weekly, monthly or yearly basis. For example, consider a business which needs to produce monthly sales reports for the senior management for each of the product lines. When a report is run by the end user, selection data needs to be entered on the selection screen of the report. The end user may be required to enter around ten fields to generate the report. 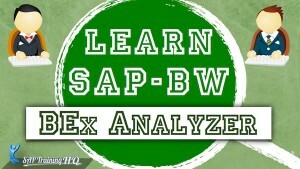 SAP makes it possible to enter this data every time with a single click. This would save a lot of time for the end user and also prevent the generation of the wrong report due to human error while entering data in the selection screen. A number of such tricks are described below. 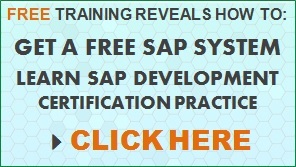 SAP arranges all the transactions in the form of drill down menus as shown below. The sales & distribution (SD) module in SAP allows the supply chain process for the business to be mapped into the software. 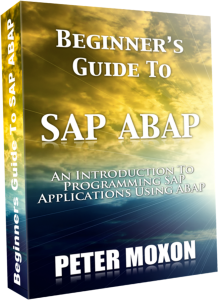 SAP provides various components like the sales area, distribution channel, division, etc. for setting up the sales and distribution organizational structure. 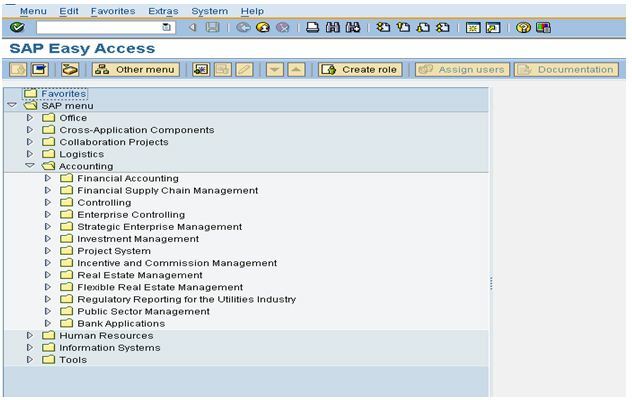 The sales and distribution enterprise structure does not exist in isolation from the rest of the modules in SAP. The sales and distribution module is closely integrated with the other modules like FI and MM. 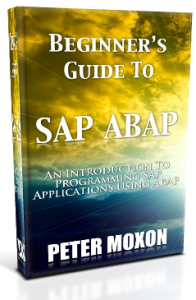 SAP best practices dictate that a good organizational structure must meet the company’s current needs and at the same time must be flexible enough to incorporate any future requirements. This makes the organizational structure scalable and ready to change with the growth of the company. The sales and distribution organizational structure is set in two steps. First of all the organizational elements are created and then they are linked to each other by specific assignments. For e.g. 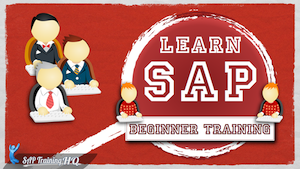 a sales organization is created first, and then it is assigned to a company code. A sales organization is the highest entity in the sales and distribution organizational structure. A sales organization represents the sales department in a company and is primarily responsible for the sale and distribution of its products and services. A sales organization needs to be mentioned while creating any sales related documents and needs to be assigned to a company code. The other sales and distribution organizational elements are assigned to the sales organization. As a part of the best SAP business practices, it is recommended to keep the number of sales organizations to a minimum. Ideally there should be only a single sales organization for a single company code. Having a single sales organization makes the reporting process simple. 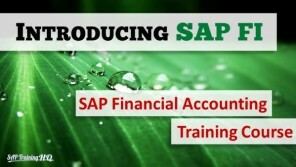 Basic financial statements are created in SAP on the basis of the company code. For traditional statements, all the transactions are grouped according to the company code and financial statements like balance sheet and Profit & Loss statements are drawn separately for every company code. But at times there is a need to carry out analysis across company codes according to some criteria other than the company code. As an example, if there is a need to generate a financial report on the basis of a product line, geographical location or divisional sales, then this can be done using Business Areas. The purpose of business areas is to report on similar activities that occur across company multiple codes resulting is cross company reporting. However the financial statements generated on the basis of business areas cannot be used for legal reporting purposes. For this reason, it is not possible to create the legally required financial statements and tax reports at business area level. Financial statements at business area level are therefore only suitable for internal reporting. Consider a situation where there are four companies in all, ABC Apparel, ABC Sports, ABC Shoes and ABC Services.